The CDUs allow the flight crew to make inputs to, and control the FMS. FMC data and messages for the crew are displayed on the CDUs. In addition to the graphic information displayed on the electronic flight instruments, CDU data is displayed in the form of pages relating to the phases of flight or performance modes. Pages can be called up for display and the data manipulated by the various keys on the CDUs. A CDU line containing boxes indicates an entry is required for FMS operation. A line containing dashes indicates an entry is optional for FMS operation. The CDUs do not accept entries which are illogical, inappropriate, or beyond the capabilities of the airplane. In some cases the entry produces no effect, and in others, generates a plain language message advising of the specific disparity. These messages are listed under FMC Alerting Messages of this chapter. 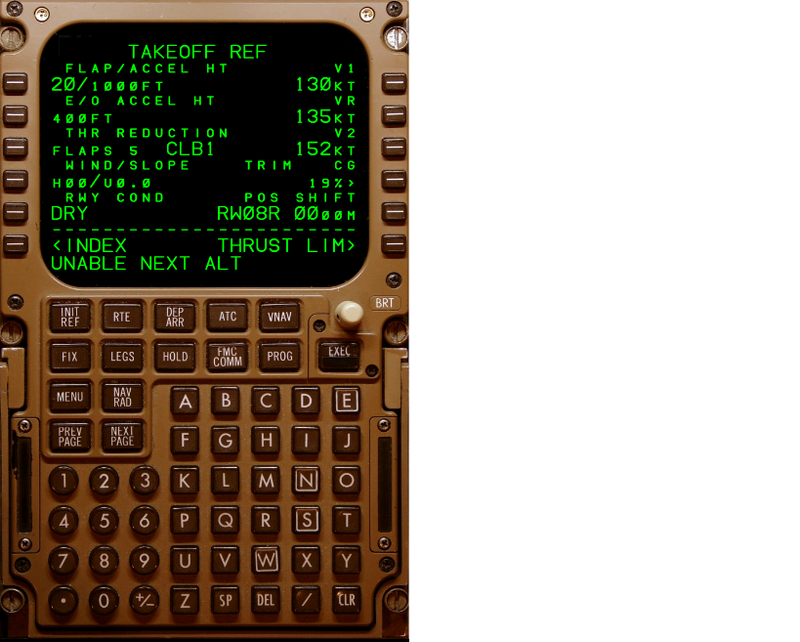 The CDU can also operate as a control panel for other subsystems such as ACARS, SATCOM, central maintenance computers (CMCs), and aircraft condition and monitoring system (ACMS). The CDU also provides backup functions for navigation, flight planning, radio tuning, and EFIS/EICAS control. The CDU includes a system MENU display page from which systems other than the FMC can be chosen to control the display. In the event	of an EFIS or EICAS control panel failure, the MENU page will provide the capability to select a CDU backup of the EFIS or EICAS control panel functions. The CDU's capability for alternate navigation and radio tuning are only available after certain failures occur. The CDU automatically activates its alternate navigation function (LEGS and PROGRESS pages) when it determines that the selected master FMC has failed. The CDU automatically activates its alternate radio tuning capability (NAV RAD page) only when it determines that both FMCs have failed.